Utena and Anthy are re-united as we step into the Black Rose Saga. This arc is a lot less about Utena, but we do get one particular development that follows her to the end. The name of this development is Akio Ohtori. Akio is first introduced to us when Utena and Anthy walk in on him getting intimate with his fiancée, a gesture that instills the alluring presence he has. However Akio, like Touga, is an actor. A fake. What makes him different, and indeed more powerful than Touga, is that he’s an adult. 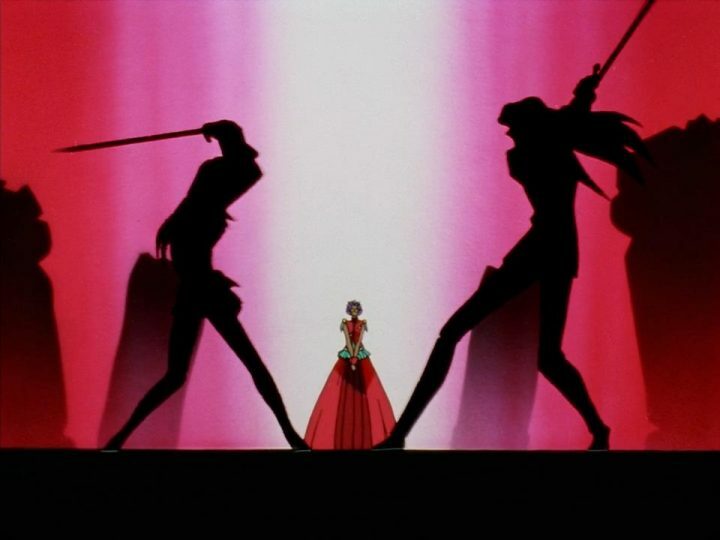 A pervasive symbol of the final arcs of Utena is cars, and in Utena fashion this imagery is played up excessively. It was said by director Ikuhara that cars are “adults’ toys”. When Akio flaunts his car he flaunts his adulthood, like a child that shows off the latest toy. It’s this adultness that Utena finds so alluring in him. Akio proudly wears the trappings of the ideal adult. Intelligent, worldly, introspective and free to do whatever he wants. He exudes a strong but laid back aura, constantly touting the desire to keep his alleged sister Anthy safe from harm while also speaking fondly as the acting chairman of the students and their free-spiritedness. 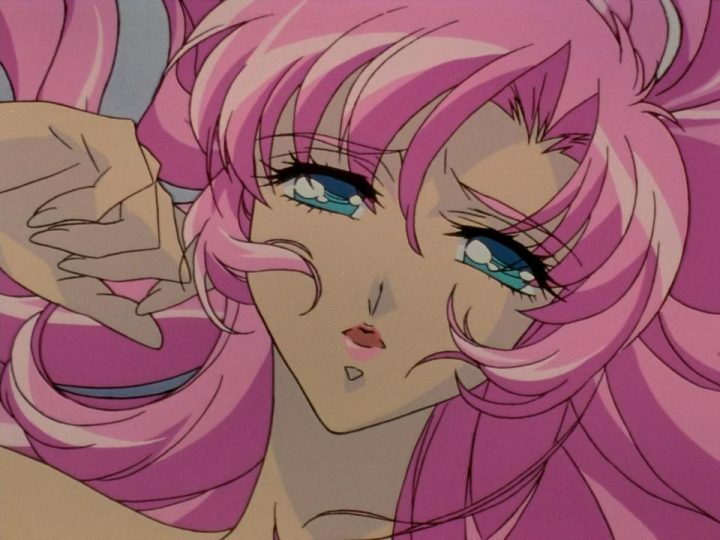 Utena comes to Akio for an adult perspective repeatedly through the Black Rose arc, and as the story progresses she finds herself seduced by the face that Akio wears. Akio shows Utena admiration for her rebellious attitude, catching Utena head over heels by making her feel understood. And the he strikes. 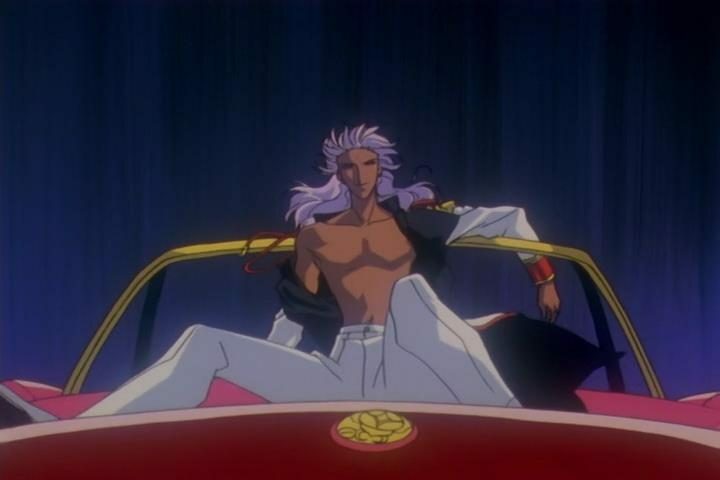 He leans Utena over the seat of his car and embraces her with a kiss. Akio preys on the feelings of a confused and infatuated teenager, even instilling guilt in her for kissing a soon-to-be married man. Akio is a dangerous person, which only becomes more apparent when shortly after he seduces the mother of his fiancée to avoid questions about his faithfulness. Akio has a lot of secrets to keep from Utena, not the least of which is the fact that he’s the one pulling the strings. He reveals himself as the secretive End of the World to the Student Council one by one, in a final bid to use their emotional baggage and adolescent desires against Utena in the rose duels. As this happens under Utena’s nose, Akio continues to draw her closer. What he wants from Utena more than anything is to control her — not only on an emotional level but on a physical level as well — as he assumes a masculine sexual dominance over her. Akio is no prince Utena, but he embodies a much more seemingly worldly ideal. He is “a real man”. As previously mentioned, passive femininity is maintained in society because of the alluring fantasy to be protected, and to the silent glee of Akio this fantasy begins to soften Utena up. Touga is in cahoots with Akio, but even he doesn’t trust him with Utena. In Touga’s mind, the only solution is to be her knight in shining armor. “If I win, you must become my woman”, he tells her as they come to their third and final duel. Underneath the child’s play of Touga’s face is a fragile self-centered masculinity, one that doesn’t know what else to do. Even with her desires flailing, Utena is still capable of overcoming this weak conviction of his. As her final duel with End of the World looms, Utena starts to become wary to the dark truth of it all. When she accidentally walks in on Akio being intimate with Anthy she selfishly feels a quiet sense of betrayal. As with most adolescents, Utena is hopelessly naïve when dealing with difficult personal issues; the only thing she feels she can do is give up and distance herself from Anthy. But these things can’t last. When Utena and Anthy later talk to one another, they pretend as if neither of them saw a thing, putting on friendly smiles and joking in sickly sweet voices about poisoning one another. As they do this, their blissfully ignorant reality falls apart, which is felt viscerally as the panning shot across the room loops and the tape playing in the background skips. Later that night Anthy tries to jump to her death, and Utena has to save her. It’s here that she sees Anthy’s suffering, and the walls the two had put around themselves come crashing down. Utena admits to her own selfishness in wanting to be Anthy’s prince, and Anthy tells her tragic story. Anthy was the princess who took the prince from the townspeople, and their judging swords piercing her tell her not to act out of her role. 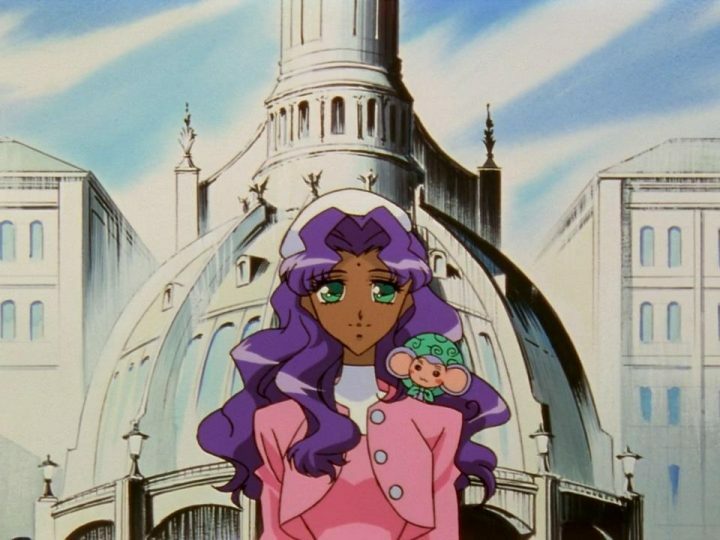 Up until now Utena had let herself affirm Anthy’s passivity, but in this moment she shows her own vulnerability, and forms a true connection with her as an equal human being. Utena understands that she needs to fight for Anthy not just for her own sake but for both of their sakes. One final time she goes to the duelling arena to confront End of the World, Akio Ohtori. At first Akio tries to lure her in to his princely ideal, but Utena resists. With the fantasy dead, Akio reveals “reality”. The entire duelling game was a ploy, and the castle where eternity dwelled was nothing but an illusion. He shames Utena for falling for him, and he tells her that Anthy is the rose bride solely because she chooses to be. But the real reason Anthy chooses to be a passive figure is because she doesn’t think she has any other choice as a woman, nor does she think a woman like Utena can save her. She sides with Akio and stabs Utena in the back, leaving both of them to suffer. 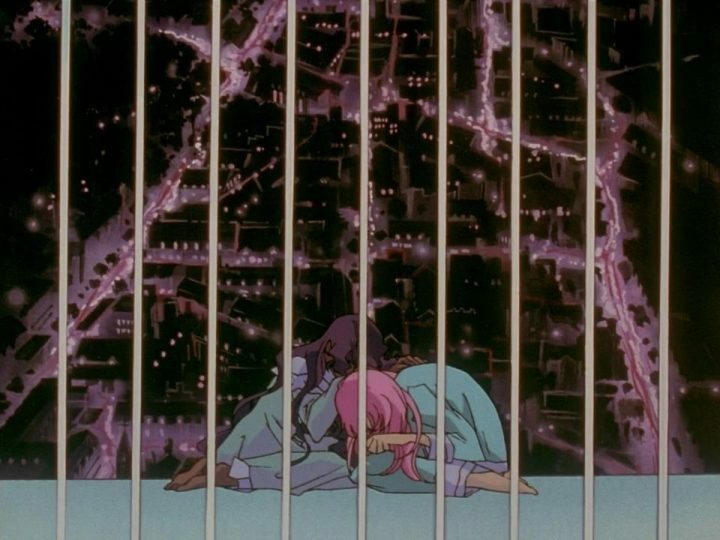 Utena cries for Akio to help Anthy, who now visibly lies above the arena pierced by the judging swords, but he ignores her. Akio had feigned intimacy with Anthy, but with the mask of identity performance off, the only thing that concerns him is taking back the power to grant miracles that was once his, trying desperately and failing to open the gate where it lies. Utena is rendered passive and helpless, as the spirit of the old prince Dios comforts her patronizingly. Ever the hard-headed idealist Utena resists, and despite her wounds Utena wills herself to her feet on her own strength. Utena stumbles and falls, but when Akio catches her she shoves him aside. With tears in her eyes, Utena makes her ultimate confession to Anthy: “the only time I’ve ever been happy was with you”. These are melodramatic words spoken by an adolescent who doesn’t quite understand the world, but to Utena and Anthy they carry meaning. They carry mutual empathy. This moment of heightened emotions creates the miracle. Anthy is freed of the swords, and a symbolic and literal coffin appears wherein she lies. With bruised hands, Utena pulls the coffin open, and for the first time Utena meets not with the rose bride but with the real Anthy that lies inside. 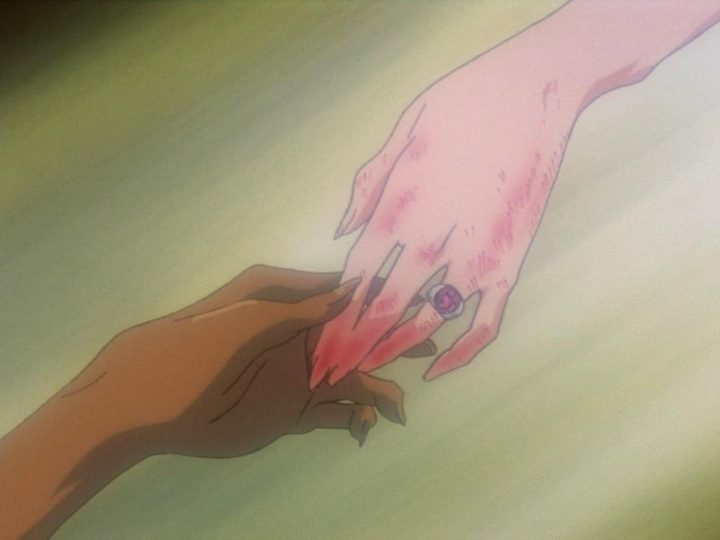 With all her strength, Utena reaches out to Anthy with a hand, not as a heroic prince but as a lover and a friend. For just a single instant of pure intimacy they hold hands, before the crumbling arena pulls them apart. In the final moments that we see Utena, we see her lamenting that she couldn’t become a prince, as she bears Anthy’s suffering and takes the swords. There was no revolution. The schoolgirls remain passively girly and the shadow puppets chit-chat about marrying rich men. To the students, Utena is nothing but a gradually forgotten urban legend, living only through the rumors of where she went. To Anthy, however, Utena is still much more. As Akio gleefully talks about Utena being forgotten, Anthy asserts that she’s only forgotten in his reality. Revolutionary Girl Utena ends with Anthy standing up for herself, abandoning Akio and going out to search for Utena. Kunihiko Ikuhara’s Revolutionary Girl Utena is a sublime, bizarre, and rich tapestry. Our main character Utena Tenjou is just one lens to view it through, but through her we see the sometimes overwhelming story of Utena at its most intimately personal level. Utena wasn’t able to save the world, but she did save the one closest to her. And now the one closest to her will be the savior in return.